Sunday on the steep steps of Iglesia De Santo Tomas in Chichicastenango Guatemala is not a subdued experience. Sitting on them it was hard to figure out what to observe first— worshippers burning small fires and incense, Maya women selling bundles of flowers, their children playing nearby or the bustling market at its feet. Elderly women huddle together draped in blankets to keep warm in the early morning hours. Below them traders carry large bundles of goods expertly wrapped in beautiful hand woven blankets. Iglesia De Santo Tomas is a perfect example of religious fusion in Guatemala. Although the church is Catholic ancient Maya beliefs prevail. Its steps serve as an altar where devotees pray and chant while swinging containers full of smoking incense leaving a surreal haze. Some place small offerings of flowers and corn inside the large wooden doors of the church. 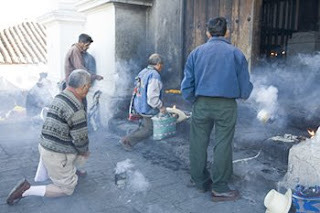 If you find yourself in Chi Chi to visit the market, try and go on a Sunday when the church steps are in full swing. 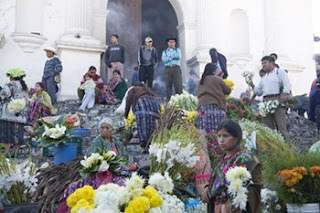 You are likely to see colorful processions of prayers leaders parading through the market and up the steps.